It seems everyone is pretty busy this month with work, vacations and Brodaks going on so the July/ August Newsletter will be small. We needed to get it out to be sure everyone gets the updates on our events. 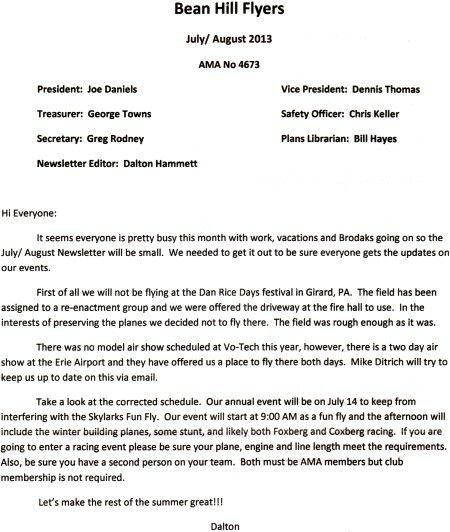 First of all we will not be flying at the Dan Rice Days festival in Girard, PA. The field has been assigned to a re-enactment group and we were offered the driveway at the fire hall to use. In the interests of preserving the planes we decided not to fly there. The field was rough enough as it was. There was no model air show scheduled at Vo-Tech this year, however, there is a two day air show at the Erie Airport and they have offered us a place to fly there both days. Mike Ditrich will try to keep us up to date on this via email. Take a look at the corrected schedule. Our annual event will be on July 14 to keep from interfering with the Skylarks Fun Fly. Our event will start at 9:00 AM as a fun fly and the afternoon will include the winter building planes, some stunt, and likely both Foxberg and Coxberg racing. If you are going to enter a racing event please be sure your plane, engine and line length meet the requirements. Also, be sure you have a second person on your team. Both must be AMA members but club membership is not required. Let's make the rest of the summer great!!! July 14 - The Annual Bean Hill event, including the Winter Building Planes, skill level stunt and some racing. 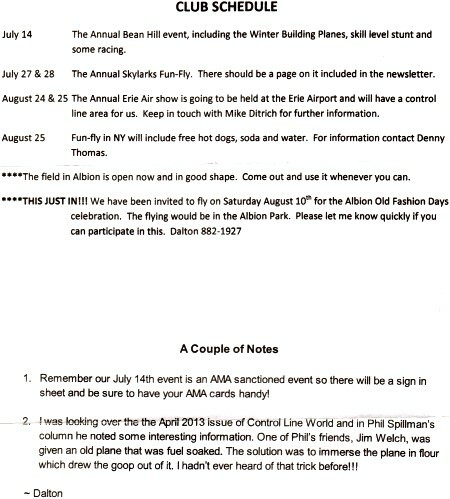 July 27 & 28 - The Annual Skylarks Fun-Fly. There should be a page on it included in the newsletter. August 24 & 25 - The Annual Erie Air show is going to be held at the Erie Airport and will have a control line area for us. Keep in touch with Mike Ditrich for further information. August 25 - Fun-fly in NY will include free hot dogs, soda and water. For information contact Denny Thomas. **** The field in Albion is open now and in good shape. Come out and use it whenever you can. Remember our July 14th event is an AMA sanctioned event so there will be a sign in sheet and be sure to have your AMA cards handy! I was looking over the April 2013 issue of Control Line World and in Phil Spillman's column he noted some interesting information. One of Phil's friends, Jim Welch, was given an old plane that was fuel soaked. The solution was to immerse the plane in flour which drew the goop out of it. I hadn't ever heard of that trick before!!! 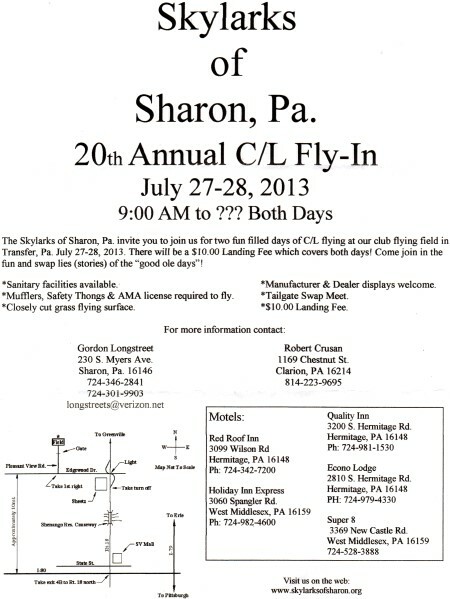 The Skylarks of Sharon, Pa. invite you to join us for two fun filled days of C/L flying at our club flying field in Transfer, Pa. July 27-28, 2013. There will be a $10.00 Landing Fee which covers both days! Come join in the fun and swap lies (stories) of the "good ole days"! *Mufflers, Safety Thongs & AMA license required to fly. *Closely cut grass flying surface. *Manufacturer & Dealer displays welcome.